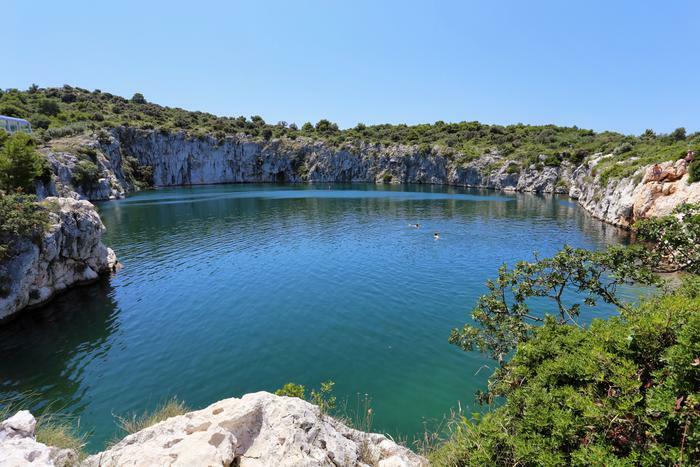 If you're planning on spending your holiday in Rogoznica, be sure not to miss visiting an unusual hydrogeomorphic phenomenon – Dragon's Eye Lake located in the vicinity of one of the most beautiful Adriatic marinas – Marina Frapa. This lake is wrapped up in many legends about dragons, Greek mythology heroes and, on top of all that, aliens! Keep on reading and find out why Dragon's Eye Lake in Rogoznica is something you have to see during your Adriatic holiday. There are a couple of local legends about this lake. The legend which gave the lake its name talks about the dragon Murin. Murin was the son of goddess Hera and Poseidon, the god of sea, born out of wedlock. Poseidon ruled the Vela Smokvica island and protected the people of land. But, in return, Murin asked to make the prettiest girl his wife. He would then kill her on their first wedding night. One day, Aristol appeared, the grandson of Jason the Argonaut, and fell in love with a girl who was supposed to be the next victim of Murin. Aristol challenged the dragon to a duel of spears. The spear was forged by god Hephaestus. In his last moments, the deadly wounded dragon took out his own eyes and threw one over the island of Mljet and the other fell under his feet and melted stone. The sea poured in where his eye fell. Because of Aristol and his bride's happy ending, there is a belief that couples who take a swim in the lake will have a lifetime of happiness and love. Another interesting, but not so romantic legend is the one about two brothers, one of which was blind. During the inheritance settlement, the other brother cheated the blind one who cursed the newly gained land. The blind brother said: ”If you didn't make an even split, let it all become a lake.” And that is how the Dragon's Eye Lake came to be. A recent legend brings aliens into the picture. According to some, this is the place where a spaceship crashed. Every 30 years, aliens send signals to the outer space wanting to contact their planet. These signals are the reason why the lake boils and why animals and plants die. The scientific explanation of the Dragon's Eye Lake is pretty simple. It is considered that the lake came to be in the process of a cave destruction. After the last Ice Age, the hollow of the cave was filled by sea water and so the Dragon's Eye became a lake. The lake consists of a couple of layers of water. On the surface, the water is green and blue, and in the middle, it is yellow and green. The lower layers have no oxygen; there is only a thick layer of hydrogen sulfide which makes the water turn pink. Sometimes the layers mix so the color of the lake changes. People say that the water boils because the dragon is waking up. Actually, conditions without oxygen cause the life in the lake to die. This used to happen in the last couple of years, but the lake life successfully adjusted to the conditions. But there's nothing to worry about. You can swim in the lake, especially because it is warm. Jumping off cliffs surrounding the lake is also very popular. If you're planning to visit the Dragon's Eye Lake during your holiday, stay in Rogoznica. Rogoznica is a town in the center of Dalmatia. A tempting atmosphere of a fisherman's Mediterranean town, valuable gastronomic offer and 56 km long coastline make Rogoznica one of the most popular tourist destinations in Dalmatia. Rogoznica is also very popular among sailors. Marina Frapa, located in Soline bay and protected from wind on all sides, has 450 well equipped berths, and 150 dry berths. Marina has a hotel, pool and a conference hall. Rogoznica has a number of beaches ideal for guests of different interests. The most popular pebble beach is Šepurina where you can find a cafe and a pizzeria. Miline beach in the town center is most popular among families with children, while concrete beach Črljine is ideal for jumping into the water. Those who love being active can take three different cycling routes, long walking paths along the beaches and join a couple of diving schools to explore the underwater world. Popular diving locations are the Planka cove, Smokvica and Hrid Mulo. Where to stay in Rogoznica?